Tarzan is a series that aired on NBC from 1966 to 1968. The series portrayed Tarzan (played by Ron Ely) as a well-educated character who had grown tired of civilization, and returned to the jungle where he had been raised. It was filmed in Brazil. The production later relocated to Mexico. This series was set in the newly independent Africa of the time. This series retained many of the trappings of the film series, included the "Tarzan yell" and Cheeta, but excluded Jane as part of the "new look" for the fabled apeman that executive producer Sy Weintraub had introduced in previous motion pictures starring Gordon Scott, Jock Mahoney, and Mike Henry. CBS aired repeat episodes of the program during the summer of 1969. Maurice Evans had a recurring guest-starring role as retired Brigadier Sir Basil Bertram, hero of the Battle of the Bulge. Julie Harris had a recurring guest-role as missionary Charity Jones. Chips Rafferty had a recurring guest-starring role as Dutch Jensen. When a blind girl's seeing eye lion is mistaken for a rogue, Tarzan must prove the beast's innocence. The vengeful son of an ivory poacher swears revenge on Tarzan. A post worker desperate for money abducts Jai's pet leopard. The Lord of Jungle must race against time when Jai is bitten by a poisonous spider. After a police officer is injured by a diamond thief, Tarzan must prevent the officer's tribe from exacting vigilante justice. Tarzan helps out a woman seeking to retain leadership of her tribe. A big game hunter targets a puma Tarzan has captured. The jungle lord tries to stop a bloodthirsty Colonel from taking over an African village with his soldiers of fortune. However, Tarzan has been rendered temporarily deaf by an exploding hand grenade, effectively limiting one of his keen senses, so he must rely on his near-telepathic ability to communicate with a lion. Rendered deaf by an explosion, the jungle lord still tries to stop a colonel from taking over a village. National General Pictures released this two-parter theatrically in 1970 as Tarzan's Deadly Silence. Tarzan and Jai protect a young prince. After Jai is bitten by a leopard, Tarzan must recover a special serum that can save the boy. Tarzan joins an athletic championship, but an attempt to steal the prize happens. A criminal known as the Admiral and his crew poison the waters so they can be the only ones to take pearl oysters. Tarzan must save a young girl and battle a criminal. One of the criminal's two minions (Robert J. Wilke) ends up being fatally devoured by a crocodile. A scientist (Henry Silva) pits Tarzan against his computer, which can predict Tarzan's every move. Tarzan and Jai must help a chief rescue his superstitious tribe from a volcano that's about to erupt. A corrupt government official uses a local legend to his advantage to get people away from a mineral deposit. 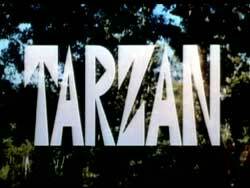 Tarzan reluctantly recruits three escaped convicts to help him get a group of children and their caregiver to safety. Jai is held hostage by criminals seeking stolen diamonds. A smuggler sends assassins after Tarzan and a young woman because they threaten to expose a smuggling scheme. Tarzan leads a young woman to a red-headed Irishman who may have a clue to her brother's disappearance. A native chief and a corrupt government official capture Sir Basil Bertram before he can arrange tribal treaty. Tarzan leads a group on the search for missing artist Rona Swann; a group member uses the safari as a cover for a gun-running operation. An exiled chief plots to steal his tribe's priceless ruby. A con man's minion (Henry Beckman) ends up being fatally devoured by a crocodile. A native revolutionary and a foreign soldier try to prevent a little girl from revealing the location of an oil-rich field. An American midwestern missionary enlists Jai's aid to fulfill her father's final wish and deliver an organ to a primitive tribe, but their boat is disabled. Tarzan rescues Charity and Jai from hostile natives, but then the trio are pursued by another tribe who are after the guns that Jai hid from them. Jai and Dutch encounter a fugitive who makes an attempt to evade a manhunt by joining the circus. A female criminal and her goons threaten to destroy a native village unless Tarzan submits to being their prisoner. Sir Basil Bertram recruits Tarzan and Jai to assist him in order to discover the location of a Communist country's nuclear detection equipment. Tarzan's search for a murderer is complicated by a village whose natives employ drugs in their ceremonial rituals. An engineer ignores Tarzan's warning about a tiger on the loose. Jai's pet elephant is blamed for the death of a commissioner. The jungle lord must track and capture two escaped convicts before more people are put in danger. The jungle lord leads an archaeological expedition to a burial ground deep in the jungle in defiance of an ancient taboo. A power-mad colonel plans to steal the jeweled idol and dynamite the burial ground. The jungle lord battles to save a young woman from a curse of death implemented by a witch doctor. The jungle lord assists a female journalist expose a rigged tribal election. A unrepentant Nazi urges Tarzan to assist him in locating a buried fortune left over from the war. A mob makes an attempt to fool Tarzan and Jai into assisting them to recover stolen money after a plane crash. A young doctor gets help from Tarzan when he faces to forces opposed to his clinic: a witch doctor who has threatened the young man with death, and the young man's socialite mother, who wants him to return home. A widow leads a cult of religious pilgrims on a dangerous journey into forbidden land beset by saboteurs as well as hostile natives. Tarzan aids a religious group on their pilgrimage to an area known as the Mountains of the Moon. Jai suffers a memory loss, but ends up being involved in stealing a sacred ruby. A colonel and his heavily armed troops overrun the land of a peace-loving tribe, but he has reckoned without Tarzan. Three nuns become unwitting pawns in a struggle between the village chief and a scheming land developer. Tarzan fights a powerful land owner who has duped an engineer into dynamiting a mountain range, a project that will wipe out several native villages. Tarzan is imprisoned when he tries to release the Dwsari tribe which has been tricked by a smooth-talking American. Against the Tarzan's wishes, Jai is given a rifle by one of the local hunters. The jungle lord searches for Cheeta. The jungle lord is tricked into helping a corrupt police inspector who intends to murder a crusading missionary. Tarzan and Chief Bangu are forced to forget their mutual animosity as they team up to search for the chief's son and Jai, who have been kidnaped by a gun-toting thief. As the jungle lord and a bandit engage in a battle of wits, a young woman tries to use both men in an effort to set free her husband, a hostage in the bandit's camp. General Basil Bertram and missionary Charity Jones return in this two-part story, and this time must ally with the jungle lord against a band of slavers who have been taking people and destroying villages. The jungle lord goes after the slave traders whose prisoners include Jai. After a poacher known for his arson escapes from custody, the jungle lord tracks him and his adoring girlfriend to an oceanside cliff, and a fateful encounter. But the poacher's girlfriend and two minions later track Tarzan down and force him to lead them back to the scene. The task of protecting a village from a man-eating lion is complicated by the arrival of a man determined to prove himself superior to Tarzan - by killing the jungle lord. A girl requests help from Tarzan to find her long-lost uncle. On March 13, 2012, Warner Bros. released Tarzan: Season 1, Part 1 & Tarzan: Season 1, Part 2 on DVD in region 1 via their Warner Archive Collection manufacture-on-demand service. The second season was released on September 17, 2013. After being seen intermittently in syndication and on cable in the years after its network run, as of 2016, the series airs on the Heroes & Icons network Saturday mornings. It lasted until September 2018. On June 4–5, 2016 the Decades TV network ran a marathon of the series. On September 9, 2016 Decades celebrated Tarzan's fiftieth anniversary repeating a few choice episodes. Iguazu Falls, in opening scene. This series had two separate musical theme's as featured in Season One. "Tarzan's March" by far being the overall favorite but unfortunately not featured in Season Two for the opening scene or the end credits. "Tarzan's March" music originally written by "Sydney Lee" gained additional fame and covered by several artists including "Al Hirt & His Orchestra", "Marty Manning & The Cheetahs" & even "Lawrence Welk & His Orchestra". ^ a b "Tarzan". Heroes and Icons TV.com. Retrieved 2017-03-28. ^ By Ed the Reviewer. "Tarzan - Season One: Part Two". Wbshop.com. Retrieved 2017-03-28. ^ By Ed the Movie Reviewer. "Tarzan: The Complete Second Season (MOD)". Wbshop.com. Retrieved 2017-03-28. Wikimedia Commons has media related to Tarzan (1966 TV series).